The Western Australia Kimberley region is the favourite playground of many Australian nature and travel photographers. It's easy to see why. The Kimberley is a dramatic landscape of intense colours. 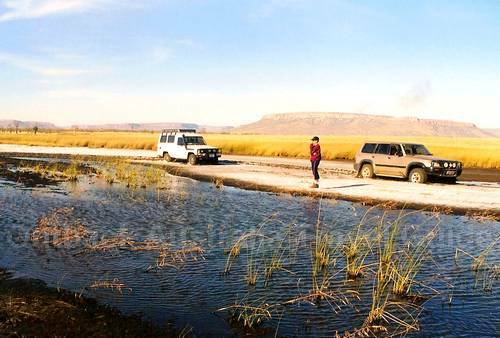 Vast plains, huge tidal rivers, rugged ranges, spectacular waterfalls and gorges... I have yet to meet a tourist who isn't spellbound by the beauty of this area. You can see what I mean by the intense colours of this region. I took this picture on the Tableland Track. 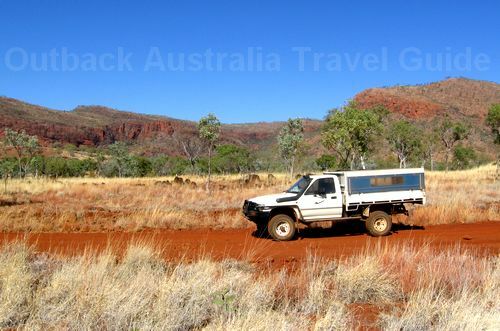 This track connects the Great Northern Highway (the main road from Kununurra to Broome) with the famous Gibb River Road (a remote, unsealed road from Kununurra/Wyndham to Derby). The rocks in the background are the very last part of the King Leopold Ranges, a rugged mountain range dissected by gorges and waterfalls, and the Tableland Track climbs right through the ranges. A very memorable drive, and a rough one, too. 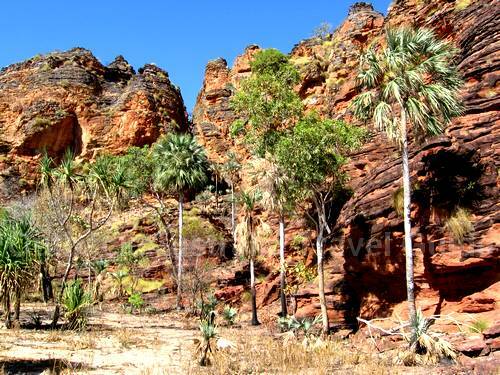 This Kimberley photo was taken somewhere between Kununurra and Wyndham, on a side track of the King River Road. I think. I can't tell you more because we were actually lost ;-). The King River Road connects the Victoria Highway (from Kununurra to Wyndham) with the Gibb River Road near the Pentecost River Crossing. The hills in the background are the beginnings of the Cockburn Ranges, a magnificent mountain range that can be seen in many commercial photos of the Gibb River Road. What makes the Kimberley such a special region in the harsh Australian Outback is the water. Rivers, gorges, creeks and waterfalls... But also this man made natural wonder. 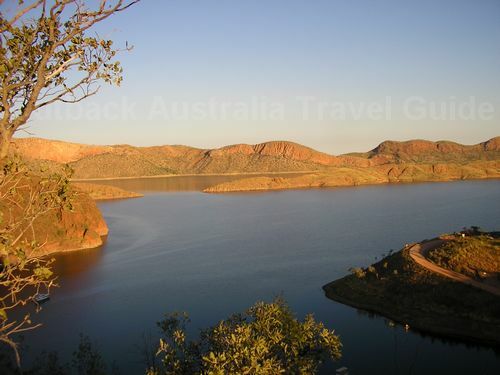 Lake Argyle is only a one hour drive from Kununurra. The dam was built in 1971 to supply water to the farms around Kununurra. Today the huge lake is a big tourist attractions and a paradise for bird watchers. 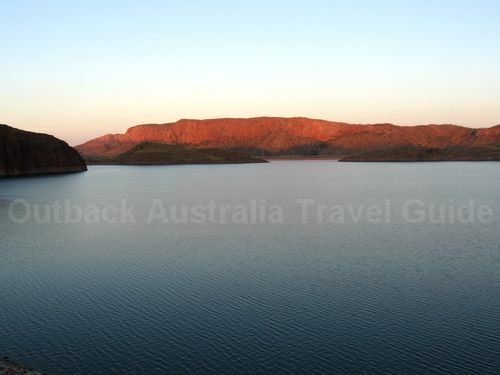 The only way to appreciate the vast dimensions of Lake Argyle would be a scenic flight. Any photos of it can only capture a very small part. 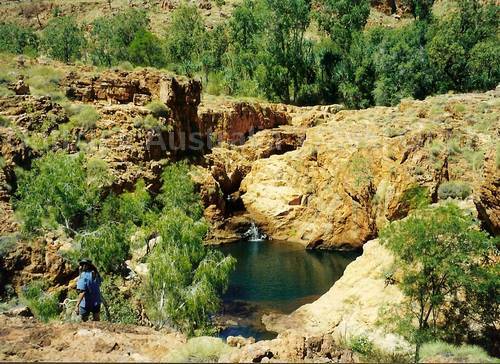 The picture shows one of the pools above a main pool called "Harry's Hole", situated between Kununurra and Halls Creek. Harry's Hole is a popular swimming and camping spot with the locals. It doesn't see too many tourists as it is hard to find, and the drive is not easy. The road you see here isn't flooded. That's how it's meant to be. Ivanhoe Crossing is just a couple of kilometres outside Kununurra. 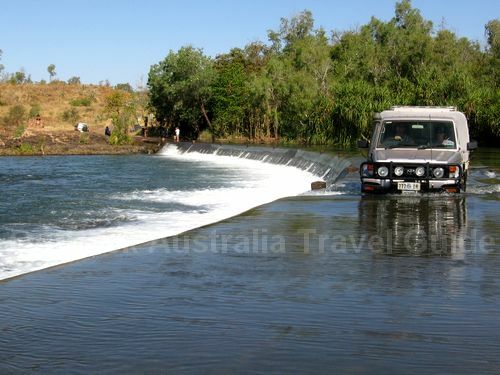 This is where the old road between Kununurra and Wyndham crosses the Ord River, and it's another popular spot with the locals. People love to come down here in the afternoon to sit in the water with a beer, and to throw in a lure and catch some barramundi for dinner. A familiar picture: red, porous, layered sandstone characterises much of the Kimberley region. The dome shapes you see here are very similar to those found in the famous Bungle Bungles or Purnululu National Park. The Livistona Palms are typical for the region, too. More information about the Kimberley region, many more Kimberley pictures, and a free printable guide can be found here.